Home / News / USUE . Russia. History. May 30, an agreement on cooperation was signed between the Multimedia Historical Park "Russia is my history. Sverdlovsk Region" and Ural State University of Economics. 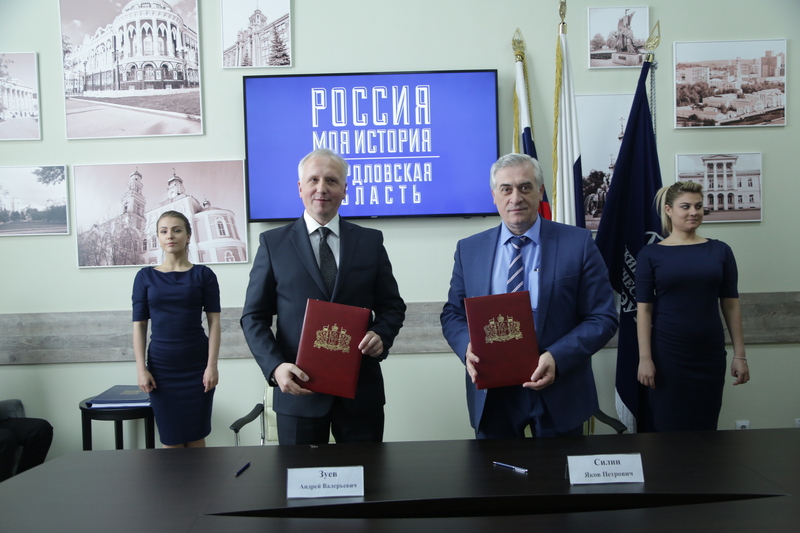 The USUE rector Yakov Silin and the acting director of the museum Andrei Zuev signed the document. "Business relations with one of the largest universities in the region - Ural State University of Economics began with us since the opening of the multimedia historical park on September 3, 2017. However, this cooperation is clearly not enough. The signed agreement opens up new opportunities for cooperation and is truly a landmark event. In addition to excursions, we are ready to conduct open lessons of history and joint cultural and educational events for students," Andrey Zuev said. The USUE rector also stressed the special importance of signing the agreement for training specialists: economists, financiers, technologists, and managers. "Knowing the history of your country is of great importance, along with the special knowledge that students receive at the University. Every person should be a citizen of his country to the fullest. Without studying history, this is impossible," Yakov Silin said. “We cannot allow distorting and rewriting history, so the multimedia historical park should become a big department of history for all educational institutions in Yekaterinburg and the Sverdlovsk region. No university can create what the multimedia historical park offers. " Witnesses to signing the agreement were university veterans and students. After the document on cooperation was countersigned, the audience went on a sightseeing tour of the multimedia historical park. Many of them were in the museum for the first time and they made no bones of their enthusiasm and great interest. The museum really presents great opportunities for in-depth study of history. The halls show all the stages of the formation and development of the Russian state. The history appears in newsreels, documents, quotations of leaders, in persons, enterprises, wars, labor victories, and defeats. Guidebooks and "smart" interactive screens, information desks and kiosks are an excellent way to cope with extensive information. And, of course, one visit to the museum to learn the history of our great state will not be enough. "Multimedia historical park ‘Russia is my history. Sverdlovsk region’, in fact, is a living textbook of history. It fully reflects the historical events from the birth of the Russian state to the present day. The information is provided in a modern style with the use of IT-technologies, which, sometimes, is much more interesting to today’s youth, than the state educational programs. The curricula for students include historical disciplines. Therefore, visiting the museum will be useful for them not only because of their own interests but also within the framework of the curriculum," Oksana Arkhipova, the director of the Museum of USUE History, says. Leaving the multimedia historical park, in honor of a new stage in the joint work with the museum "Russia is my history. Sverdlovsk Region" Yakov Silin inscribed his name in the Museum Visitors’ Book. It should be noted that thanks to the signed agreement, students could visit the museum in groups with a guide. The fixed ticket price for them is 25 rubles. The leadership of the USUE has already signed eight similar agreements. Earlier, an agreement was concluded with the museum of local lore, which includes eight sites, including the Ernst Neizvestny Museum and the A.S. Popov Museum of Radio, which university students could attend at a reduced price. Besides, on this list, there are the Museum of the Ministry of Internal Affairs, the Museum of Home Front, the Museum of NPO Automatiki, the Airborne Guard Museum, and the UMMC Military Vehicles Museum. USUE students will take full advantage of the wide opportunities provided to them for studying the history of Russia and the Urals.